Your turn. Same organizations. 14,727 letters asking them to review and endorse the Petition to the APA. It doesn’t matter where you are. It doesn’t matter if you live in a different state or different country, 14,728 voices directed toward four organizations. Don’t let me work harder for your children than you do. Work for each other, work for all children everywhere. And we’ll work for your children, each for the other. When you come together in a single voice, you are more powerful than you know. Then, do you know what I’ll do next? I’ll select another four states and I’ll send each of them a cover letter, the Petition to the APA, and 350 pages of your signatures – or 400 pages, or 800 pages, whatever you give me to work with. I will take your voice to professional psychology. The strength of that voice is up to you. There’s a reason I selected each of the first four. California is obviously my home state. Texas has developed a substantial foundation in creating the change. Dwilene Lindsey and Children4Tomorrow are a force to be reckoned with. I’m sure they could use your support. If you have any financial resources and you want to make a donation to end “parental alienation” and support healthy child development, Children4Tomorrow would be my strongest recommendation. They will absolutely 100% put the money to good use protecting children from the psychological child abuse of “alienation” surrounding divorce. Pennsylvania also has active forces moving for change, and through individual efforts were able to get me invited to present to their state legislature. I think I was successful in bringing your voice to them. Things are moving forward in Pennsylvania. There are other active states, Florida has psychological child abuse legislation submitted, New York, North Carolina, Arizona, and others are churning with activity. I chose Great Britain because it is the home of John Bowlby and attachment theory. Honoring the authenticity of the attachment bond to both parents belongs in Great Britain. It is overdue for Great Britain to claim its leadership in solving attachment-related pathology. 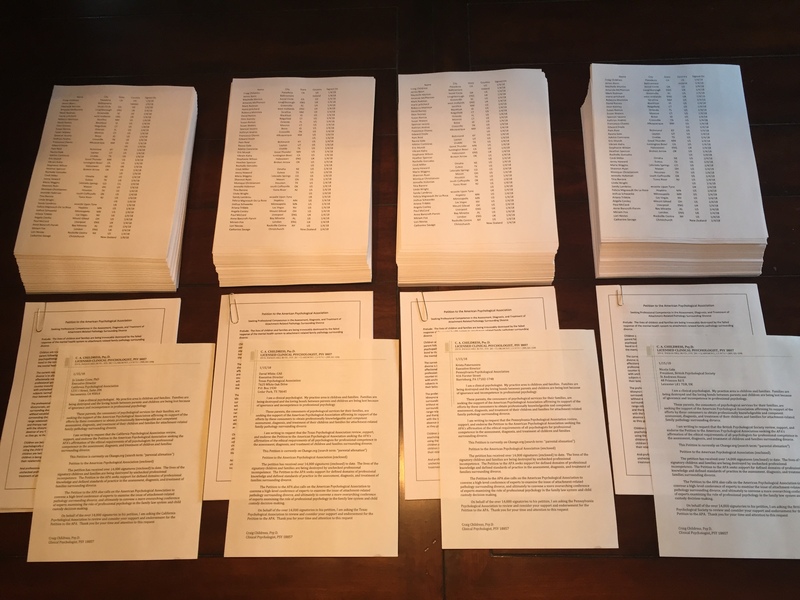 Creating and mailing a submission packet of 350 pages of signatures costs me about $50 per packet, and I plan to send packets to the psychological associations of each of the 50 states and multiple foreign psychological associations. Why am I doing this? Why am I spending my money on your kids? Because your children need me to do it. We are going to solve this for all children everywhere. It would be much less expensive if I didn’t send 350 pages of your signatures. I’m sending 350 pages of your signatures. As I was downloading your signatures, I scrolled through all 350 pages of signatures. Each name, each family, each bond of love – destroyed. It was emotionally powerful, to hear each voice speak on 350 pages. I’m sending 350 pages of your signatures because I want them to hear your voice as I hear your voice. The pathology of “parental alienation” must end. The time of battle for your children is now. We will no longer tolerate the destruction of children’s lives, we will no longer tolerate the destruction of families. We will no longer tolerate the psychological abuse of children. You are the warriors for your children, and the time of battle is now. We are on the battlefield now. We need your voice, now. These submissions to professional organizations are not designed to have an effect on the organization, they’re designed to have an effect on you. Don’t let me fight harder for your children than you do. 14,729 voices directed toward four organizations. Make a statement to these four organizations. And then we will select the next four. I will do everything I can to take your voice to professional psychology, because your children need me to do that. This is a narcissistic pathogen. The solution is the opposite of narcissistic, it is empathy for the other, doing for the other. It must become about solving this for all children everywhere, not just for the children in this or that specific family. No matter what state or nation you live in, work for each other. Come together into a single voice, an unstoppable voice for change. Start with these four organizations. Be kind, always be kind. And be relentless. Then we will select the next four. We are going to solve this for all children everywhere. Because your children need us to. Make the most of yourself! Reach your potential! When your most important developing years don’t allow much development to occur, and when whatever development that manages to occur is skewed by the misplaced hatred one parent has induced you to carry about your own other parent, then you are a victim of severe alienation. And you do not even know! That is severe parental alienation. That is my daughter. That is why I shall be sending these four letters and that is why male or female, politically left or right, young or old, black or white, rich or poor, atheist or believer, on this issue we come together. We do not want any more of our sons, we do not want any more of our daughters, DESTROYED. A thousand hugs for Dr. Childress’ meticulous and determined endeavor. Letters now please! Thank you all. 14,997…. not sure why I am so looking forward to 15K, but I am. Previous Previous post: Redux: Dr. Bernet, join me.